For many years Richmond Va. artist/musician Dave Brockie has been known to the world as GWAR’s pig-snouted and bellicose lead “throat-thing”, Oderus Urungus, playing to semi-packed houses around easily 35% of the world. Never one to shy away from using GWAR’s success as a way to gain attention for a bewildering variety of side projects, including a glut of bands (X-Cops, Death Piggy, DBX), a variety of bizarre performances (F-Art Players, Chippy the Chippopautamus, The Crack-a-thon), and a slew of demented drawings and illustrations, Brockie has now added literature to his already bulging quiver of artistic arrows. Eleven years after its completion, Brockie’s sprawling epic of modern war and ancient necromancy, Whargoul, has finally been released in book form by Eraserhead Press http://eraserheadpress.com. 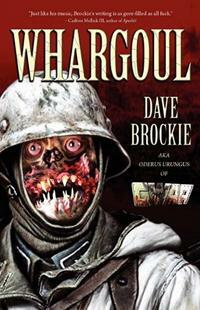 The story of the Whargoul came to being in the late nineties as Brockie toured Europe with GWAR. Inspired by some of histories more despicable events, Brockie began drawing and writing about the creature that called itself “Whargoul”. The idea of an undying creature that found sustenance in the carnage of war began to flesh itself out in the form of several comics for the now defunct Slave Pit Funnies, and was stand-out track on GWAR’s 1997 album “Rag-Na-Rok”. Ultimately Brockie decided the only way the story could truly be told was through a novel, and began hand-writing the book into a journal that was half-filled with pages of microscopic lettering, which he unbelievably lost, forcing him to re-write it from memory on his first lap-top. Brockie finally finished the book in 1999. The book ended up on Brockie’s long-running web-site, http://www.oderus.com/maggotmaster/index.html, where people could (and still can) download it free of charge. After languishing here for the better part of a decade it attracted the attention of Eraserhead Press publisher Jeff Burk, who after reading it decided it was good fit for the Eraserhaed/Deadite Publishing roster. Slave Pit, Eraserhead, and Deadite Publishing are proud to present Whargoul, the first novel from an artist who for over a quarter century has provided a consistent level of mayhem that few could match, or even want to. Whargoul, available at www.amazon.com.